Gluten-Free Living (GFL) magazine and the Celiac Disease Foundation (CDF) have a shared vision: to promote the advancement of celiac disease research and spotlight celiac and gluten-free champions in our community. 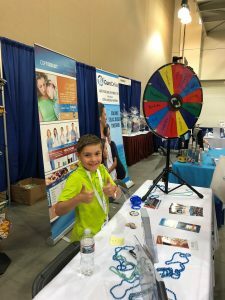 With this vision in mind, GFL is proud to introduce passionate and dedicated CDF Student Ambassadors from across the U.S. Below, meet 9-year-old Alex Bender, who collects donations toward a cure for celiac in place of birthday presents. was diagnosed with celiac disease six years ago. When I was three years old and diagnosed with celiac disease, my mom started helping the Celiac Disease Foundation by raising money from our friends and family. When I was four, my mom asked my friends to contribute to the Foundation for my birthday instead of giving me toys or other gifts. I didn’t like it at first, but now as a 9-year-old, I am happy to get donations for my birthday from my friends. My friends like to ask me questions about celiac disease and what it is like being gluten free. My mom thinks it’s good that I am able to explain to kids what it’s like having celiac disease so that they understand why I raise money. I’ve collected donations in a penny war competition as part of my summer camp. The camp leader asked me and my mom to speak in front of the campers and explain celiac disease. The campers asked questions about what foods are gluten free and what foods I like to eat. I felt happy that people were raising money to help find a cure and were interested in what I like and what I go through as a kid with celiac. As a Student Ambassador, I want everyone to understand what celiac disease is and why we need a cure. In addition to being a Student Ambassador, I love the Yankees, building Legos and playing baseball. Check out other Celiac Kids in Motion or visit our Kids’ section to find everything from fun recipes to practical tips and advice for children, adolescents and teens!